For decades, scholars have been trying to answer the question: how was colonial Burma perceived in and by the Western world, and how did people in countries like the United Kingdom and United States form their views? 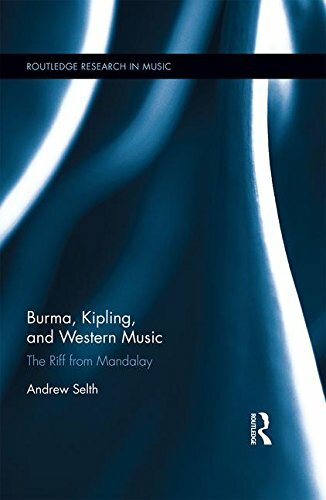 This book explores how Western perceptions of Burma were influenced by the popular music of the day. From the First Anglo-Burmese War of 1824-6 until Burma regained its independence in 1948, more than 180 musical works with Burma-related themes were written in English-speaking countries, in addition to the many hymns composed in and about Burma by Christian missionaries. Servicemen posted to Burma added to the lexicon with marches and ditties, and after 1913 most movies about Burma had their own distinctive scores. Taking Rudyard Kipling’s 1890 ballad ‘Mandalay’ as a critical turning point, this book surveys all these works with emphasis on popular songs and show tunes, also looking at classical works, ballet scores, hymns, soldiers’ songs, sea shanties, and film soundtracks. It examines how they influenced Western perceptions of Burma, and in turn reflected those views back to Western audiences. The book sheds new light not only on the West’s historical relationship with Burma, and the colonial music scene, but also Burma’s place in the development of popular music and the rise of the global music industry. In doing so, it makes an original contribution to the fields of musicology and Asian Studies. Andrew Selth is an Adjunct Associate Professor at Griffith University and the Australian National University. He has been studying international security issues and Asian affairs for over 40 years, as a diplomat, strategic intelligence analyst and research scholar. He has published six books, including Burma’s Armed Forces: Power Without Glory.